Back when I first heard about Mike's Natural Soaps, I naturally wanted to try all of them... so I bought a whole boatload of samples. Some I finished off, a couple got integrated into the tins I bought later, and some... just hung around. Got used on occasion, but not often. Part of the reason why is that chasing a small piece of soap around the bottom of a tupperware isn't a great way to lather up, part is that there were scents that wasn't my favourites. In an effort to tidy up and get some use of out the leftover samples, I decided to combine them into something I call Mike's Mixed. The process was simpler and quicker than expected, taking less than ten minutes from start to finish - including some time in the fridge, because I'm impatient at times. 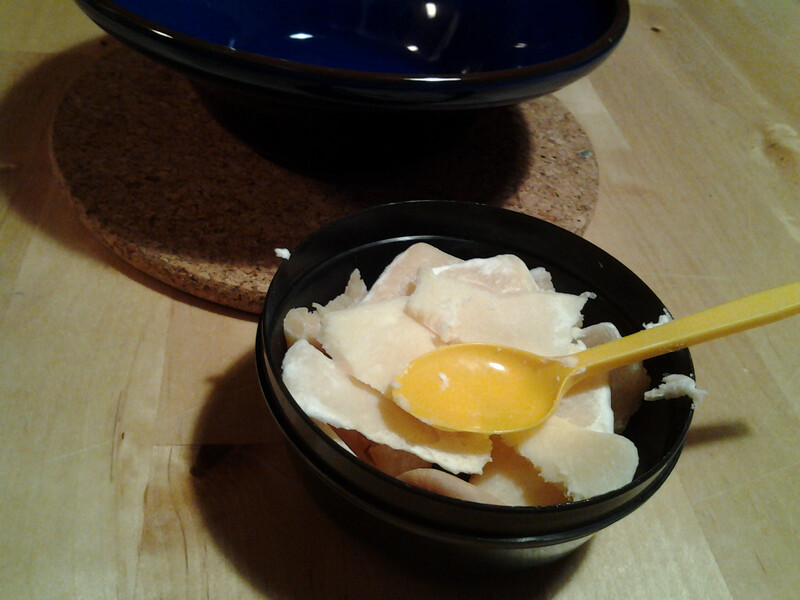 First, gather all the leftover samples. In my case, it was Lime, Unscented, Coconut, Lavindin & Eucalyputs, Barber Shop, and Orange,Cedarwood & Black Pepper. 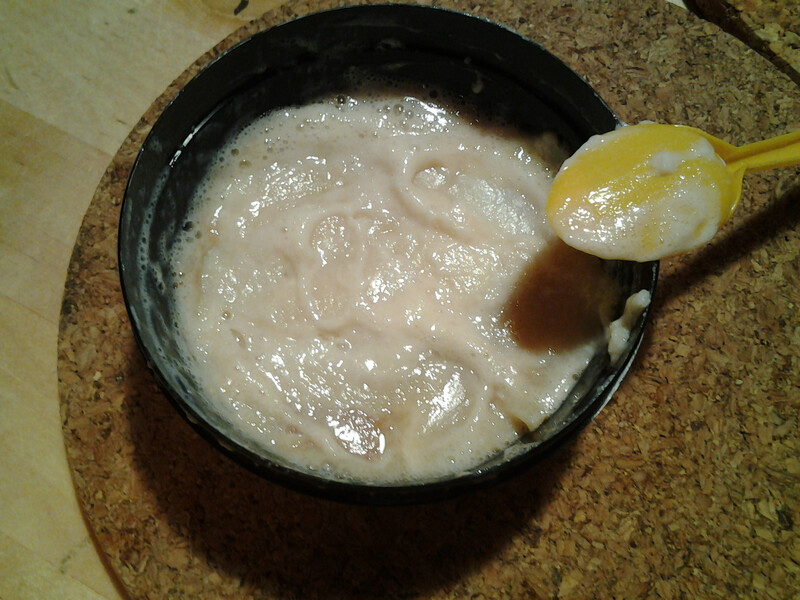 Place all in a suitable container - I used an empty RazoRock jar, simply because I have it and the lid closes tightly. Place the container with the soap in a bowl of near boiling water, and add a little less than a teaspoon of boiling water to the mix. After a minute or so the soap melts, letting you tamp it down and get rid of any air that is trapped. Smooth the top off after removing it from the hot water. Let it cool, make a label... and that is it. 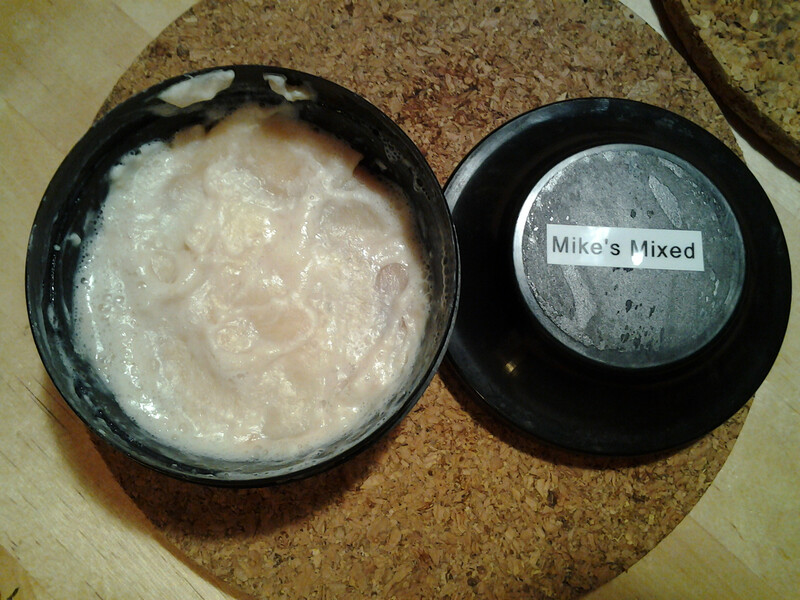 One puck of Mike's Mixed, ready to use. What does it smell like, Hans! (01-04-2015, 02:24 PM)celestino Wrote: What does it smell like, Hans! Mostly of soap - another reason for doing it was that the two year old samples kept in not-too-airtight tupperwares had lost a lot of their scent. 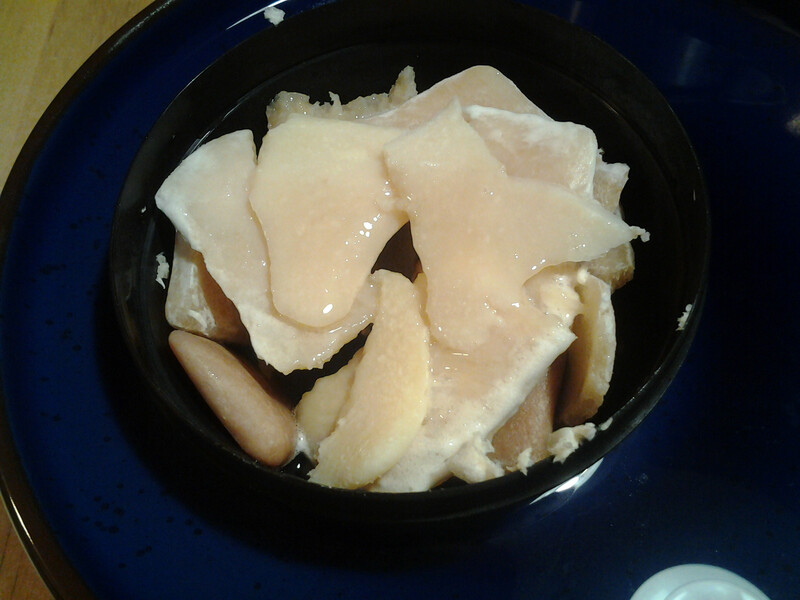 (01-04-2015, 02:54 PM)WegianWarrior Wrote: Mostly of soap - another reason for doing it was that the two year old samples kept in not-too-airtight tupperwares had lost a lot of their scent. Hans, I am not sure if that is good news or not! Only two years and they have lost their scents?! Samples with a very large surface to volume ratio - I squeesed them flat in the bottom of the tupperware - with leaky lids? Would be more surprising if the soaps hadn't lost a lot of scent. Good to hear the ones in tins are doing well! I hope my vast supply of Mystic Water pucks don't lose their scents, then! I have had some in storage for almost three years and I don't know why, but I keep ordering more! Cool idea...I have some samples that may end up being combined this way too!